Each passing day Halloween draws closer. Oh.... the plight of the dead. How I love their tortured souls. And they are tortured and sad and clearly dead. So why don't their bodies fall apart? Have you ever asked yourself that? Well, maybe they do fall apart, and maybe after awhile they turn into goo. Or maybe they turn into stone, maybe they find the fountain of youth that is really a perfume counter and Chanel No. 5 keeps them alive. OK, I said maybe and did you notice that rhymed? Sorry, I was thinking out loud typing along and there goes my thoughts. Below are books. Really good books. Without giving anything away~ every time I hear a cell phone ring, I want to scream ‘Don’t answer it.’ That sorta gave it away. Everyone has an idea of how they would survive the zombie apocalypse, and then you read this book and it’s like, good try, and no, you’re not going to survive. The Living Dead by~ where do I start? Joe Hill, Clive Barker, Stephen King, Laurell K. Hamilton, and the list goes on. I’m an absolute sucker for collections, so this was a must have. 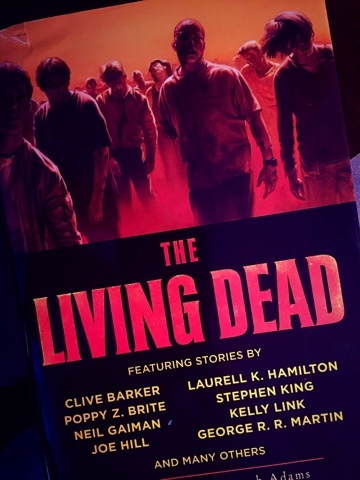 This has everything from the classic people eating zombies to using zombies as a platform for the author's passion. That’s my not so extensive list of zombie books. If you know of one or two or three, let me know! In the meantime, if you feel so inclined, you can pop on over to Home Page of the Dead and read Cessation by me~ M.A. Kastle~ just saying. As an added bonus~ A Curse Revisited, The Legend of Noah Blyth will be free from October 29th - October 31st in celebration of Halloween. I know it's great!